The Biesbosch National Park is a nature conservation area and the largest fresh water tidal zone in Europe. This means, for example, that you will find many streams and willow swamps there. With tall, luxuriant willow forests, the area looks just like a jungle! Below you can read more about the fresh water tidal zone, the flora and fauna, and how the area came to exist. 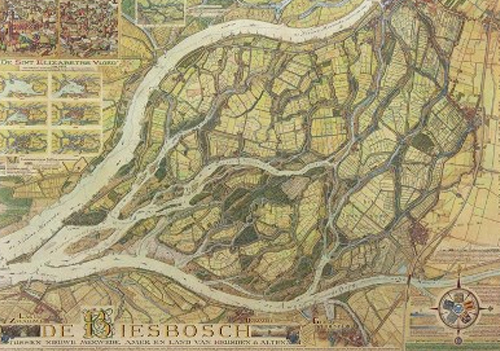 The Biesbosch forms the estuary of two great European rivers, the Meuse and the Rhine. The rivers flow into the sea via the nature conservation area. Due to its location, the Biesbosch is affected by the tides. This means that the water level varies. At flood tide, the seawater holds back the water from the rivers, and the water level is then at its highest. At ebb tide, the river water flows freely to the sea, so that the water level reaches its lowest point. The difference between the highest at lowest water levels in the Biesbosch used to be two metres. Since the Delta Works were constructed, the tidal variation is only 20 centimetres in the Brabantse Biesbosch and 70 centimetres in the Hollandse Biesbosch. Click here for more information about the Delta Works. The water in the Biesbosch is completely fresh. Such fresh water tidal zones are quite rare. Much of the Biesbosch is covered by water and is therefore lush with sedges and reed beds. A common plant is the marsh marigold, which blooms in the spring. This member of the buttercup family has adapted to the tidal movements. In the willow forests you can find many plants such as stinging nettles, orange balsam, yellow iris, cow parsley, hogweed, enchanter’s nightshade and amaranths growing luxuriantly. The Himalayan Balsam provides a real jungle-like atmosphere. Its pink flowers have a characteristic sweet fragrance. The various moist and wet parts of the Biesbosch are host to many unusual plants and animals, such as diverse species of water, reed and meadow birds. Kingfishers and bluethroats are important nesting birds. You can also come across great and little egrets nearly everywhere. The abundant plant growth provides for a rich population of insects, with unusual beetles, dragonflies, crickets, moths and butterflies. The beaver is the figurehead of the Biesbosch. About 300 beavers live in over 100 lodges in the area. 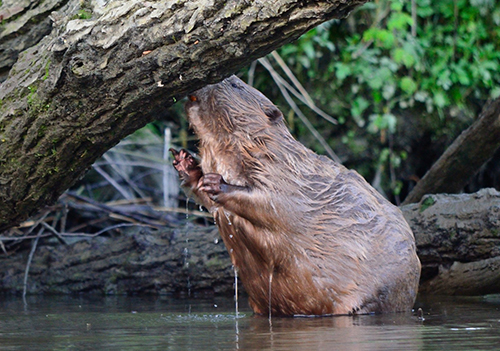 Beavers are herbivores and their preferred diet consists of tree bast, twigs and willows. The signs of their gnawing are visible throughout the area. The Biesbosch is also home to deer and foxes. Thanks to the increase in small mammals, the numerous geese, and the excellent fish stocks, more birds of prey, such as the osprey and white-tailed eagle have arrived in this area and also breed here. The ‘Saint Elizabeth Flood’ occurred in 1421. This disastrous flood led to the disappearance of 17 villages. An inland sea stretching from northwest of Dordrecht to southeast of Geertruidenberg was created. Immediately after the disaster, land fell dry again. The flow of water carried sand and clay, which sank to the bottom. The inland sea became shallower and shallower. Eventually, patches of land emerged from the water at ebb tide and rushes started growing on them. These plants flourish with their roots in the water. People planted extra rushes so they could harvest them. The Biesbosch derives its name from this plant; it means “a forest of rushes”. More land appeared; the roots were less frequently in water, and the rushes were unable to flourish so well. Reeds were able to withstand this condition better and supplanted the rushes, giving rise to vast reed beds. Subsequently, willows started to grow and people used the branches to make furniture and other products. Willows grow better when they get less water, so the people built dikes to prevent the willows being inundated at flood tide. A piece of land with planted willows is called a griend. The workers who cut willow wood were known as griend workers. Some of these workers started already working in the grienden since the age of 12. It took the men a journey of two to three hours to reach a griend. They lived in the griend workers’ huts from Monday to Saturday. The huts were small and damp, and the men slept on beds of straw. You can still find and visit authentic griend huts of this kind in the Biesbosch. 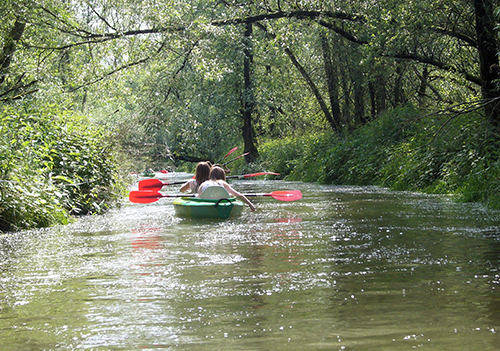 Click here for more general information about the Biesbosch.